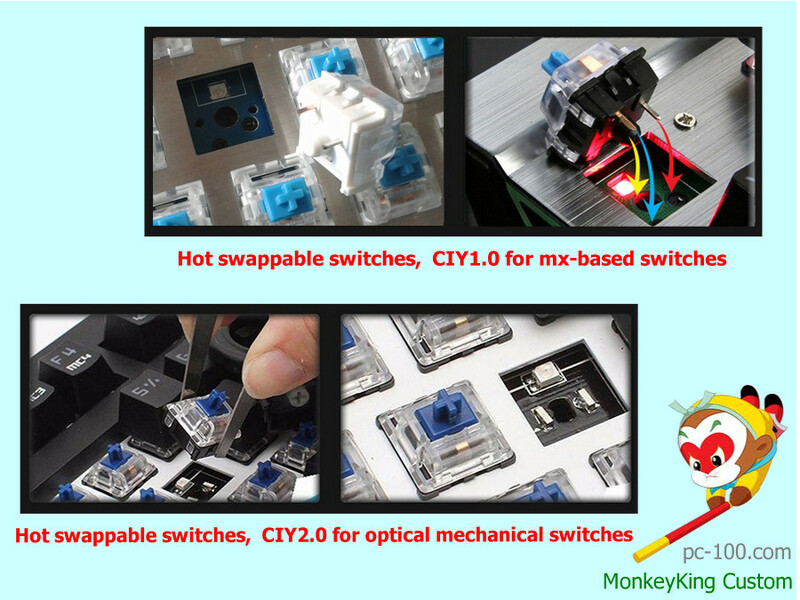 CIY – change it yourself, hot swappable switches, make customizing your favorite mechanical switches so easy. 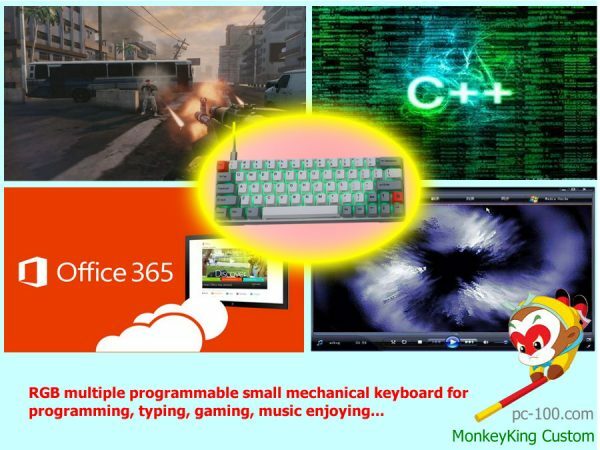 unprecedented community keyboard customized update services, supplied by MonkeyKing custom mechanical keyboard community. 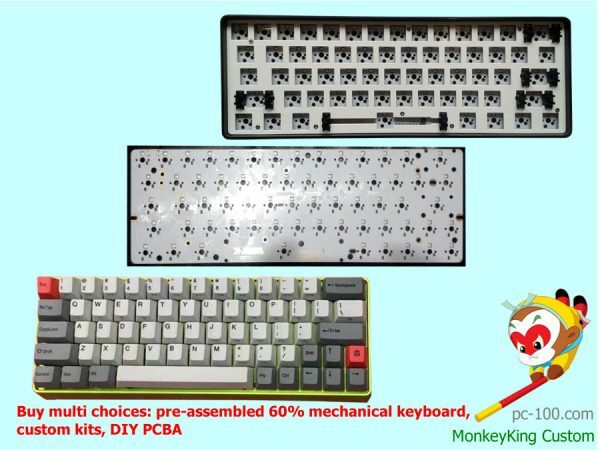 User need build one from scratch: Soldering mechanical switches, assembly of finished products and reflash firmware are not very easy for every keyboard user. Product quality can’t be assuring: GH60 PCBs always are not mass production items, and often not manufactured by standard factories. Playability is weak: By now, GH60 PCBs are without any full RGB backlit version. 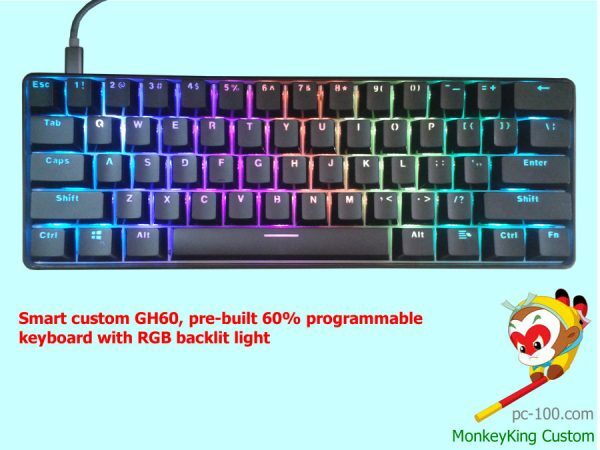 DIU RGB – DIY glorious & useful RGB backlit, fully user-defined. CIY – change it yourself, hot swappable switches, make customizing your favorite mech switches so easy. If you are a graphic designer or a computer programmer, sometimes, you need go out to your clients’ office for some working, then you needn’t bring your cumbersome PC, just with your mini mechanical keyboard, everything will be OK. So efficient, so cool. 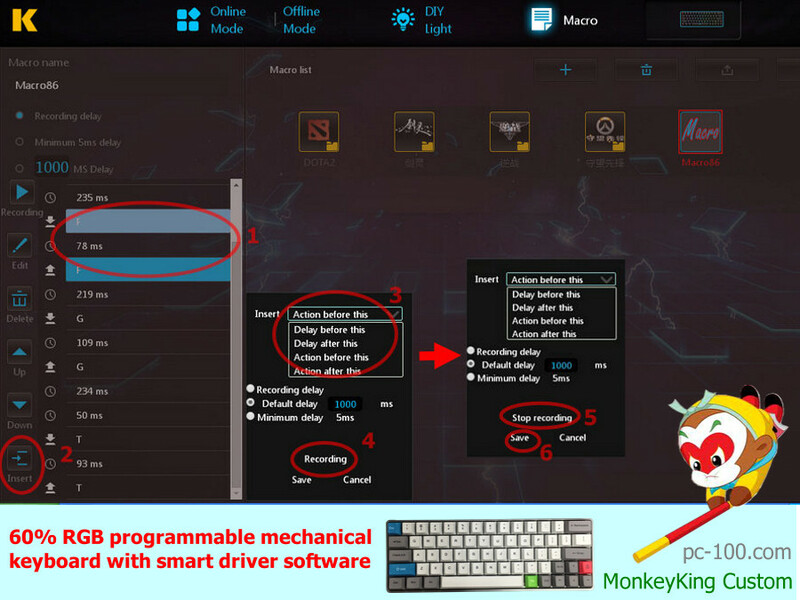 After you open the driver software, you can program any keys (except Fn key ) on online layer and 3 offline layers. All the configuration settings in the 3 offline layers can be stored in the keyboard. When you need to use these settings, you needn’t open the driver software any more. You can toggle among each offline ( onboard ) layers easily, just by typing Fn+w for opening the layer, once again typing for closing the layer, the same operation of typing Fn+e, Fn+r for another 2 offline layer’s opening and closing. 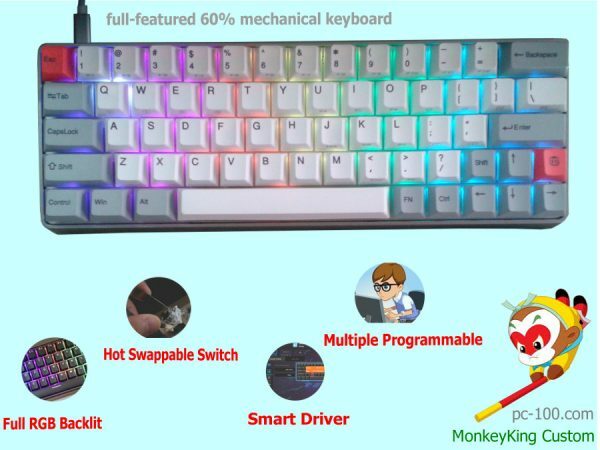 Custom your personality mechanical keyboard so easily. 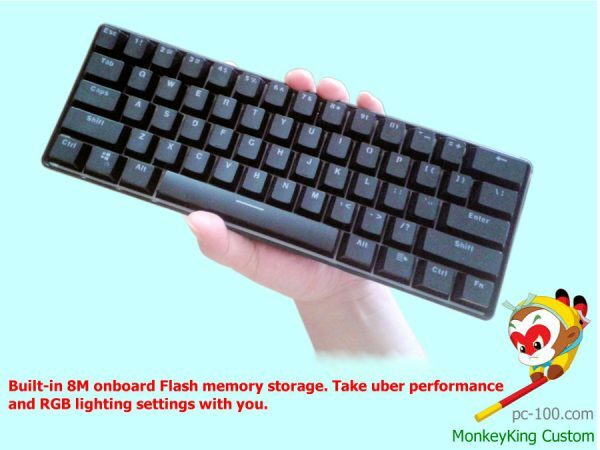 With smart driver software “MagicFinger”, IngeniousMonkey – multiple layers programmable keyboard can be configured into more layouts for good typing. 1. according to some programmers’ different typing habits: besides qwerty keyboard in default layer, dvorak keyboard, workman keyboard, Colemak keyboard and any other layout keyboard can be customized. 2. according to different operation system: the layouts suitable with PC windows, Mac OS and Linux platforms also can be customized easily in the 4 layers. 3. 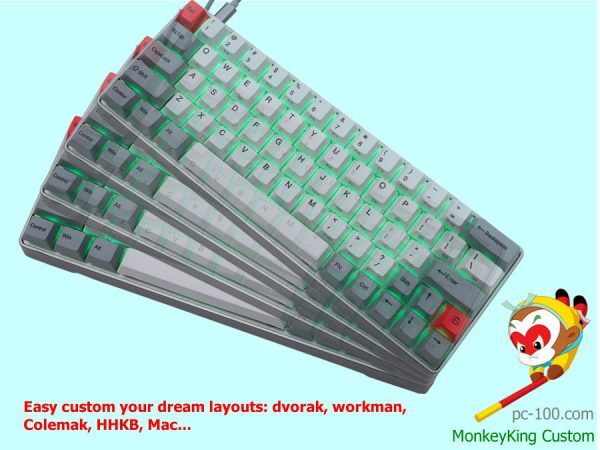 For some programmers’ loved HHKB layout, custom it without any hesitation. 4. As to what you wanted personality layout, of course, you can get it. Now IngeniousMonkey keyboard has 5 layers: one default qwerty layer, 1 online layer, 3 onboard (offline) layers. By your smart customization , you can have 5 different keyboards. 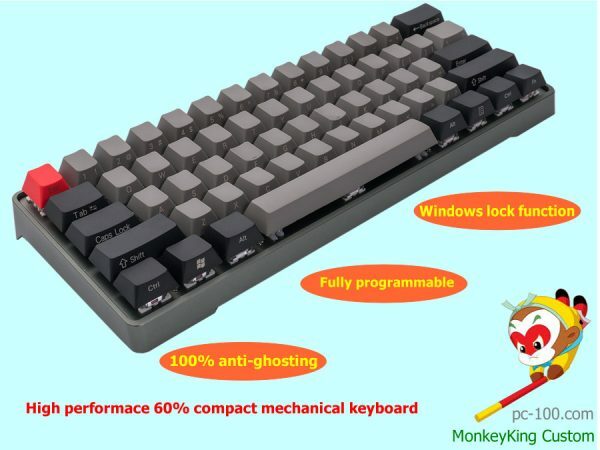 1 customized layer for office working, then it is a small office mechanical keyboard for good typing. 1 customized layer for gaming, then it is a mini mechanical keyboard for gaming. 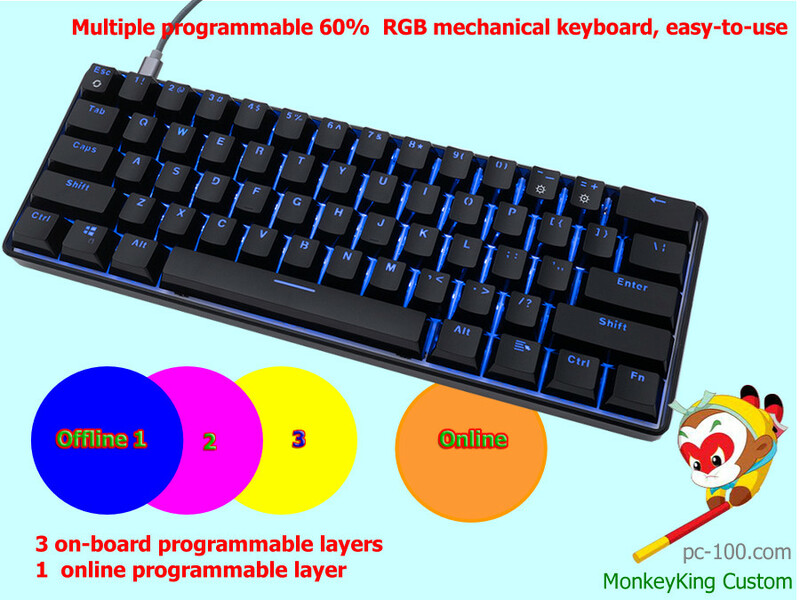 1 customized layer for your daily programming work, then it is a code keyboard, or called professional mechanical keyboard. 1 customized layer for a entertainment, it is a multi-media mechanical keyboard. 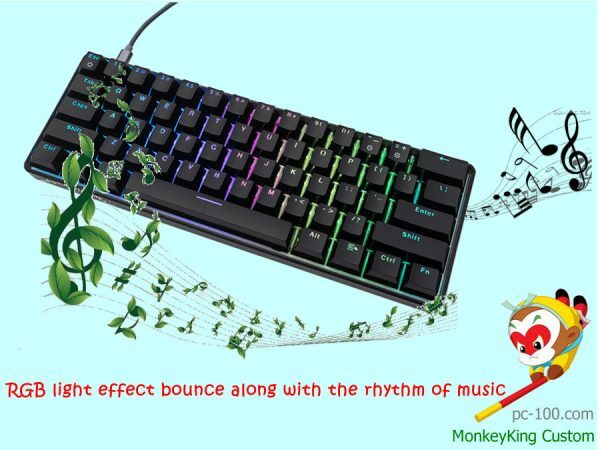 So many kinds of professional mechanical keyboards, enjoy your working, gaming, and entertainment leisure time. User can assign any functions to any keys at any programmable layers. “MagicFinger” driver software also includes our feature-rich macro editor for both keypress, text-based macros and phonic macros. For professionals, these built-in powerful functions can make you work or play games more effective. Eg: Game players can define the RGB colors for WASD keys, strengthen the gaming experiences, so cool. 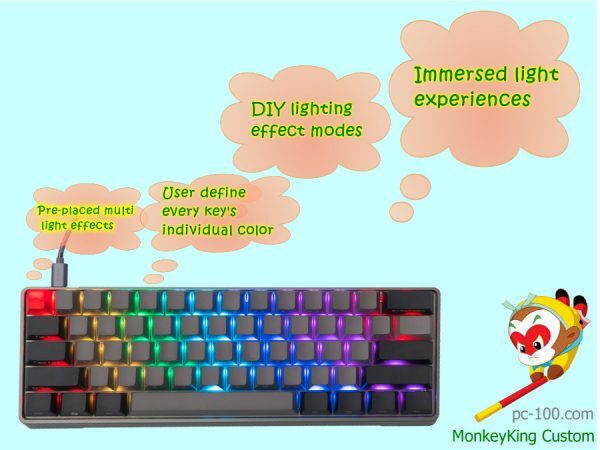 Immersed gaming and working light effects are also can be customized via MonkeyKing Custom mechanical keyboard community’s update driver software in the future. We hope IngeniousMonkey keyboard can be a real awesome mini rgb gaming keyboard. Sometimes, if you don’t like the RGB lighting, it’s easy: just by pressing “Fn + Enter”, play / stop the playing light effect will be done. 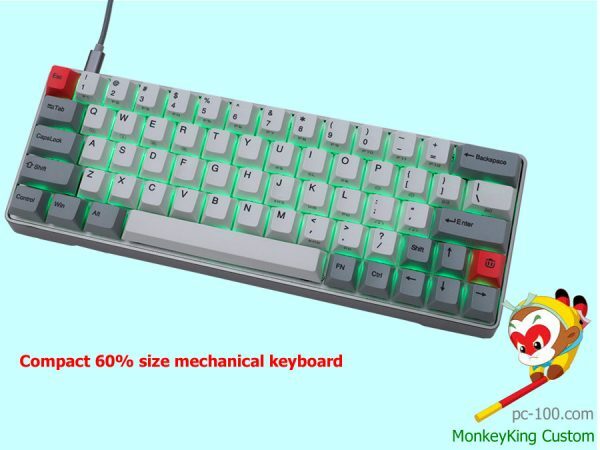 Hot swappable switches, modular mechanical keyboard design, make customizing your favorite mechanical switches so easy. Ever wonder what Gateron Blues felt like? Or what is the craze behind the Cherry MX clears? Want to use Gateron Reds for your WASD, but Gateron Blacks for all your other keys? 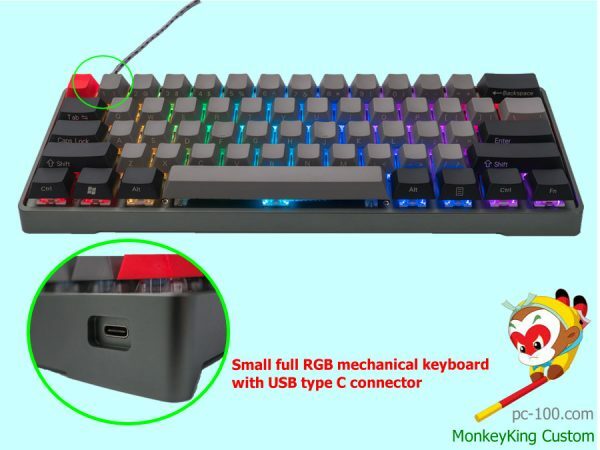 With the IngeniousMokey keyboard, you no longer have to purchase an entire new keyboard, or disassemble and solder your switches – you can simply & easily remove and install any MX-based switch ( such as Cherry, Gateron, and Kailh branded switches.) without any soldering, just like a keycap, and mix/match to test out and use any combination of switches you desire. 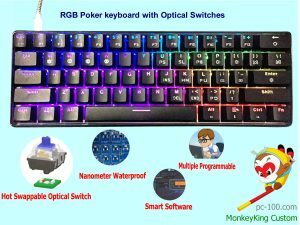 Trying out different switches, replacing old ones, and matching several types of mechanical keyboard switches used to be difficult and required extreme technical skill. Now IngeniousMonkey series optical mechanical keyboards are designed to allow you to change your key switches without the hassle of soldering. This caters to anyone who uses their keyboard for multiple purposes. 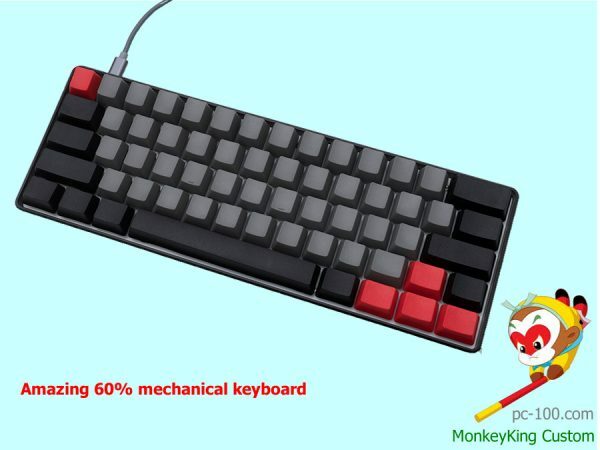 Switching from gaming to typing, for example, might require that you swap your Linear switches to Clicky ones. ponderous-heavy PC. So convenient, so efficient, so cool. More fast transfer speed, matching with fashion high- tech professional computer & gaming supercomputers perfectly. Magic entertainment function, relaxing yourself when you are in the working gaps. Nowadays we are not just ordinary persons. All of us should have our own individuality, thus we can keep up with the world. 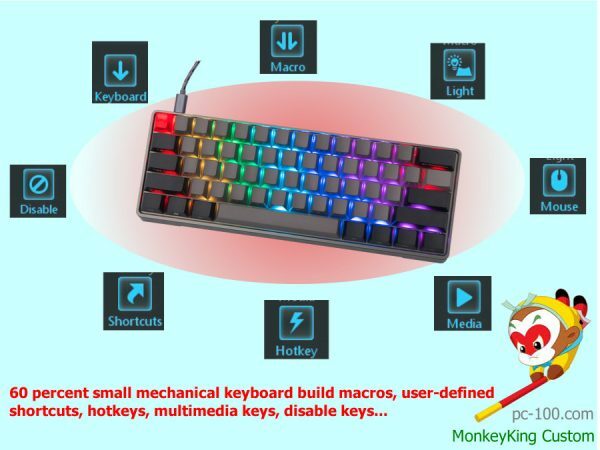 In PC peripherals input field, IngeniousMonkey keyboard just can fit for us perfectly.